It takes a team with a passion for food and sushi. SUGARFISH by sushi nozawa, with locations in Los Angeles and New York, is a different kind of sushi dining experience. Our restaurants serve only traditional sushi of the highest quality based on Chef Nozawa’s style of sushi. Our passion is to carry forward his great tradition and style of food – which many believe is the best sushi there is. SUGARFISH embodies the philosophy of celebrated sushi chef Kazunori Nozawa, well-known for his Trust Me-style sushi at Sushi Nozawa, which operated in Studio City from 1987-2012. Nozawa shuns “American-style” extravagant rolls and fusion dishes. Instead, he concentrates on the purity of his basic ingredients— nurturing relationships with the finest fish purveyors across the globe, cutting his fish with an artisan’s painstaking care, and even making his own fresh soy sauce and ponzu. To bring Chef Nozawa’s legendary food to our guests with quality and efficiency, the SUGARFISH team has made some changes that defy the conventional wisdom about sushi places. Our menu, while always featuring the highest quality items, is greatly simplified. Guests choose from three core menus called Trust Me®’s, a takeoff from the traditional Japanese omakase. The biggest change is there are no visible sushi chefs behind the sushi bar. By moving our sushi-making to the kitchen, we are set up for maximum quality and efficiency (and not for show). 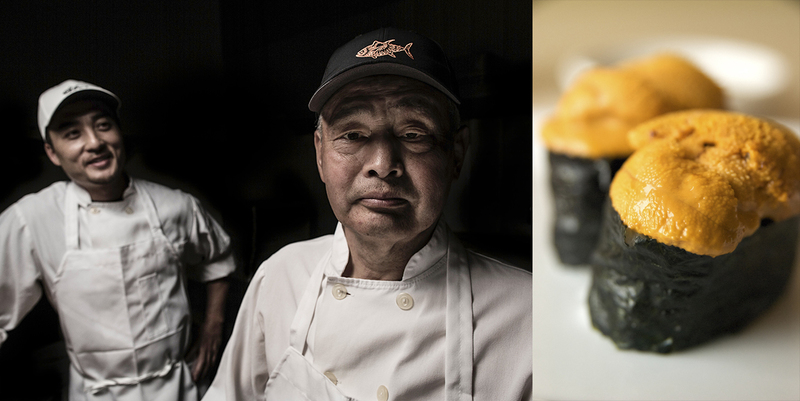 In 2008, Kazunori Nozawa and Jerry A. Greenberg founded Sushi Nozawa, LLC. Friends for decades, their plan was to take the food Chef Nozawa perfected at his namesake restaurant, Sushi Nozawa in Studio City, and make it more accessible while remaining 100% committed to the quality of the food. Tom Nozawa, Lele Massimini, Cameron Broumand, and Clement Mok — each with expertise in their respective fields — joined Nozawa and Jerry as founding partners of Sushi Nozawa, LLC to create SUGARFISH. The first SUGARFISH restaurant opened in Marina del Rey in 2008, followed by subsequent locations in the greater Los Angeles area. Sushi Nozawa, LLC also created the Nozawa Bar in Beverly Hills, and KazuNori, The Original Hand Roll Bar, in downtown LA. The partners of Sushi Nozawa, LLC serve a variety of roles in managing the restaurants. Jerry serves as CEO, and Nozawa-san is President. Tom and Lele are effectively “co-chief operating officers,” with Tom running the “back of house” while Lele runs the “front of house.” Cameron manages real estate and expansion, and Clement is responsible for the brand, design, and marketing for the restaurants. Yumiko Nozawa has also been involved with the team since the beginning, working with Jerry and Nozawa on the development of Sushi Nozawa, LLC.